There's nothing better than making Sunday morning brunch for your family and what better thing to serve your troops (along with all the other goodies you're going to prepare) than hash brown potatoes. They're inexpensive, easy to prepare (especially for a crowd) and, let’s face it, who doesn't like a crispy potato? I remember my grandmother making something similar to this dish when I was little and it was always something I looked forward to eating. No matter what time of year I make these, they're always a house favorite and really easy for me to have on the table in a jiffy! 1. On the large side of a box grater or in a food processor using the grating blade, shred the potatoes. 2. Place the potatoes in a strainer and rinse thoroughly with cold water. 3. Place on a clean kitchen towel or paper towels, squeezing out as much liquid as possible over a bowl or the sink. 3. Sprinkle the potatoes with salt and stir. 4. Heat the oil in a large non stick sauté pan over med/high heat and add the potatoes. 5. Let cook in a single layer for 4 minutes without stirring. 6. Flip with a spatula in 4 sections, cooking for another 4 minutes. The outside should be crispy and the interior soft. *To Freeze: After Step 3, simmer the potatoes in lightly salted water until just tender. Drain well. Then spray a sheet pan with non-stick cooking oil and spread the partially cooked potatoes in a single layer on the pan. Place the pan of potatoes in the freezer and leave them there until they are solidly frozen. Transfer the grated potatoes to freezer bags or containers to use as needed. When ready, thaw and follow steps 3-7. That's funny! Today I made shredded potatoes too for my daughter for lunch and when i went on your blog to check out today's recipe i laughed at the coicidence. Printed out &amp; ready to use tomorrow morning. Yum! 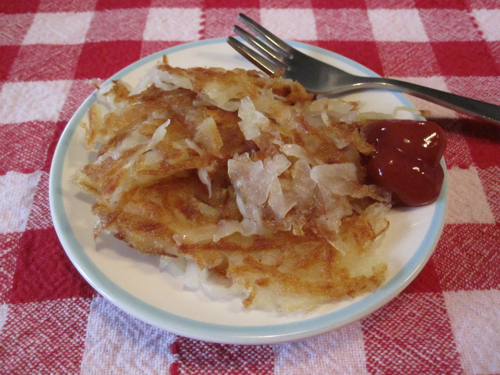 I love hashbrowns but I always thought the potatoes had to be pre-cooked so I never made them. Thanks! Weelicious â„¢ &#8211; Fast, Easy &amp; Fresh Homemade Home Made Baby Food Babyfood Recipes, Toddler Food and recipes for the entire family! &raquo; Blog Archive &raquo; Hash Brown Potatoes is actually a pretty good website. I will bookmark it and come back to it again. I just wanted to ask you what your theme is called and if I can find it for free.